Randy’s notes: This article appears on the City of New Bern website. The railroad depot, disused since 1987, was falling into disrepair until money was raised to put a new roof on it to prevent further interior deterioration. New Bern, founded as a seaport city, was losing its way due to declining shipping until the railroad was built here just before the Civil War. The railroad put New Bern back on the map. During its heyday, the train station was the transportation hub for the city and even connected to the city’s trolly service. 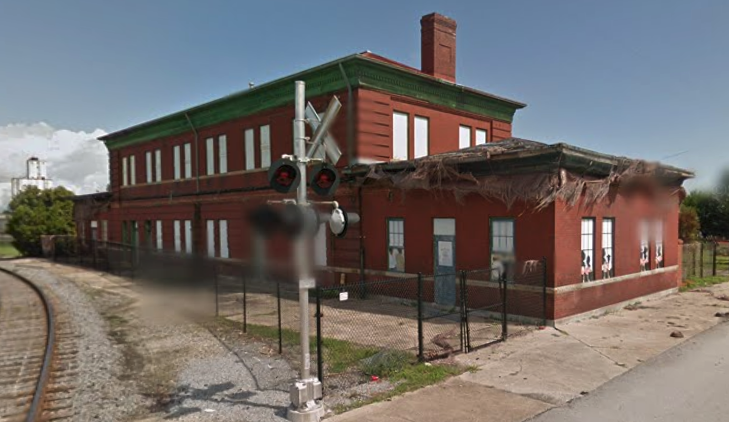 North Carolina Railroad has verbally committed to a contract extension to the license agreement for restoration of the Union Station Train Depot located at the intersection of Queen and Pasteur streets. Norfolk Southern Railroad will also have to approve the agreement. The contract extension will allow for the New Bern Preservation Foundation and the City of New Bern to move forward with an additional phase of the restoration project totaling $205,938. The partnership between the City and the Preservation Foundation now has until July 2021 to raise necessary funds and complete restoration on the historic building. The train depot was built in 1910 and remained in use until 1987. Over the years, it fell into disrepair. In 2009, a public-private partnership was formed to initiate restoration efforts. North Carolina Railroad remains the owner of the building and, under this partnership, the City of New Bern will initially serve as the licensee. Upon successful Certificate of Occupancy, the license agreement will convert to a long-term lease agreement between North Carolina Railroad and the City of New Bern. The New Bern Preservation Foundation continues its fundraising to cover the costs of the restoration project. In 2009, a joint working group was formed and an initial $500,000 grant was secured from the NC Department of Transportation. The Harold H. Bate Foundation also contributed a $50,000 Challenge Grant to the project. New Bern architectural firm Maune Belangia Faulkenberry Architects prepared plans for the interior of the depot, to include possible retail space, dining and entertainment space, and a railroad museum. Depending on the final plan, construction is expected to cost approximately $2 million. To date, the depot has a new roof, lead paint has been removed, doors and windows have been restored and are functional, and the north wing is nearly complete. The north wing was the former depot baggage room. HVAC and electrical components still need to be addressed and will be dependent upon the future needs of the depot’s tenants. Have been watching RiverSide revitalization of homes (mostly) my prediction next 5 years this area is gonna take off and become the place to live – location, location, location! Union Station however, located on the edge of historical district will do well combined site, history, retail, restaurant! My opinion. It would have been great to have had the train station reopened. One would have to travel to Wilson or other places to catch the train. The bus station that we have is terrible. New Bern should have/could have done better to provide transportation for traveling!